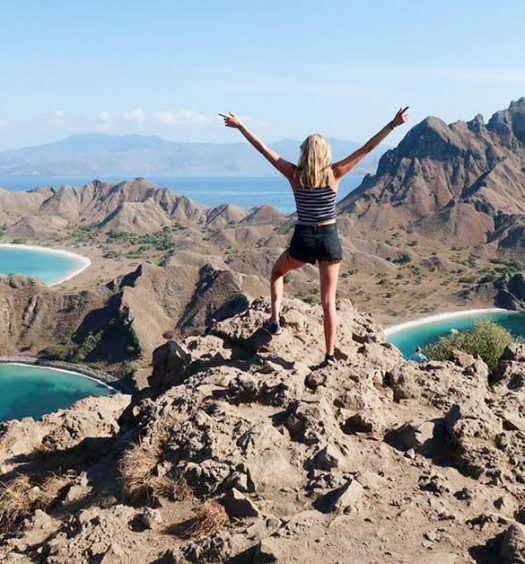 A 1.5-hour flight from Bali takes you to magical Labuan Bajo, the starting point to your Komodo adventure in scenic Flores! As one of the most raved-about destinations in Indonesia lately, Komodo Islands and West Flores are known to be largely unexplored and the famed UNESCO Heritage Site has all the makings of a tropical idyll: Pristine coral reefs packed with various species of fishes, uninhabited islands, dragon-like reptiles roaming free and sleepy fishing villages where visitors are a rare sight. But what is hard to find at a new tourist destination like this sure is a comfortable stay (with A/C preferably!). 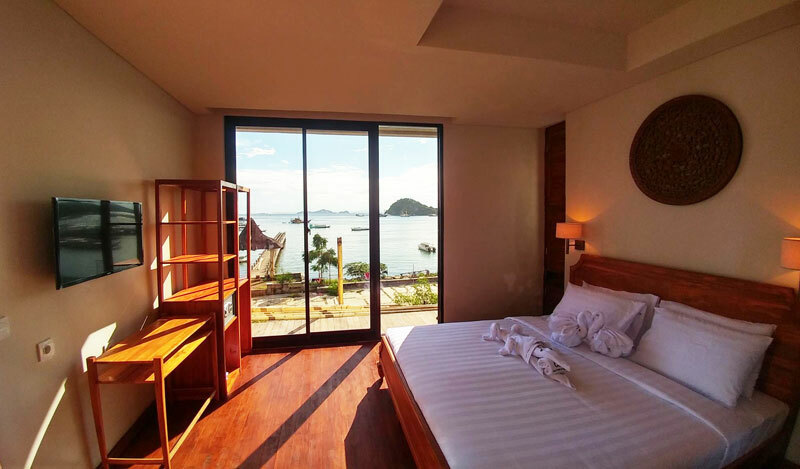 Now, forget mouldy and rusty accommodations and take a look at these affordable ocean view hotels conveniently set in Labuan Bajo – most of which are walking or a short driving distance to the harbour, town and airport. 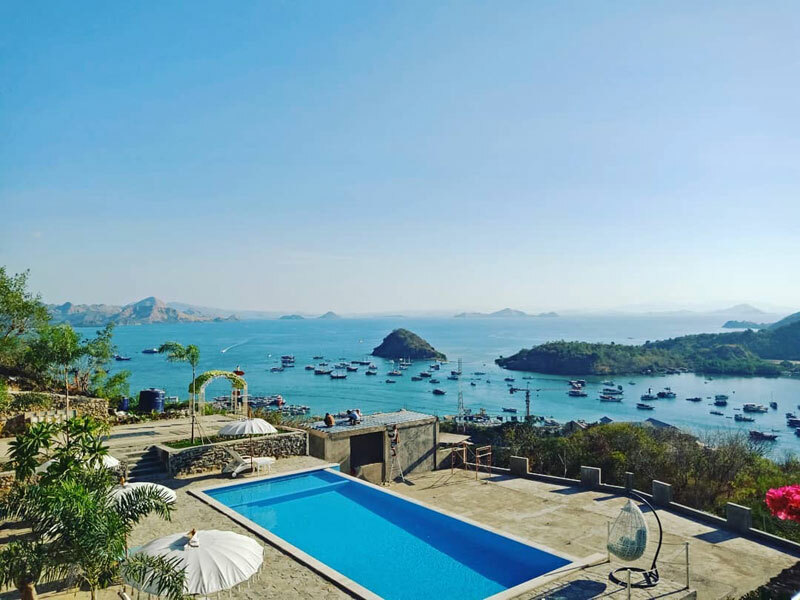 These hotels are making this unique part of the world even more special for visitors as you get to wake up to endless views of the deep blue Flores Sea before embarking on a full-day adventure to explore its underwater world. 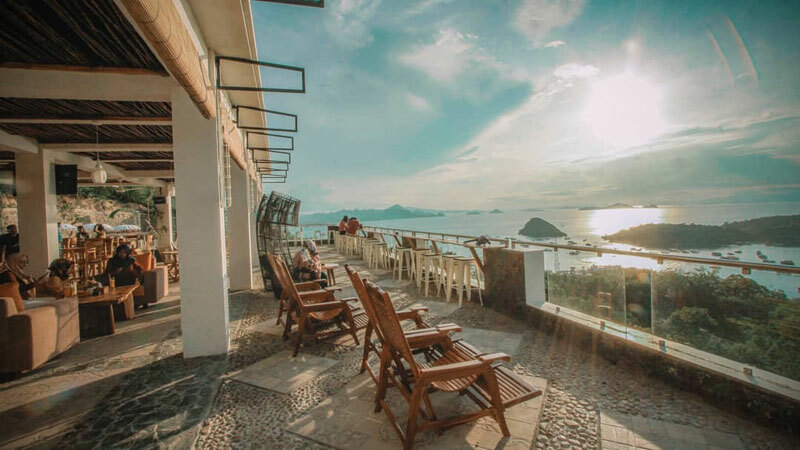 There are plenty of ways to get away from it all in Labuan Bajo and one of them is by booking a stay at Selini on The Hill Villas. Head up to your secret treehouse and enjoy a magical view of the horizon! 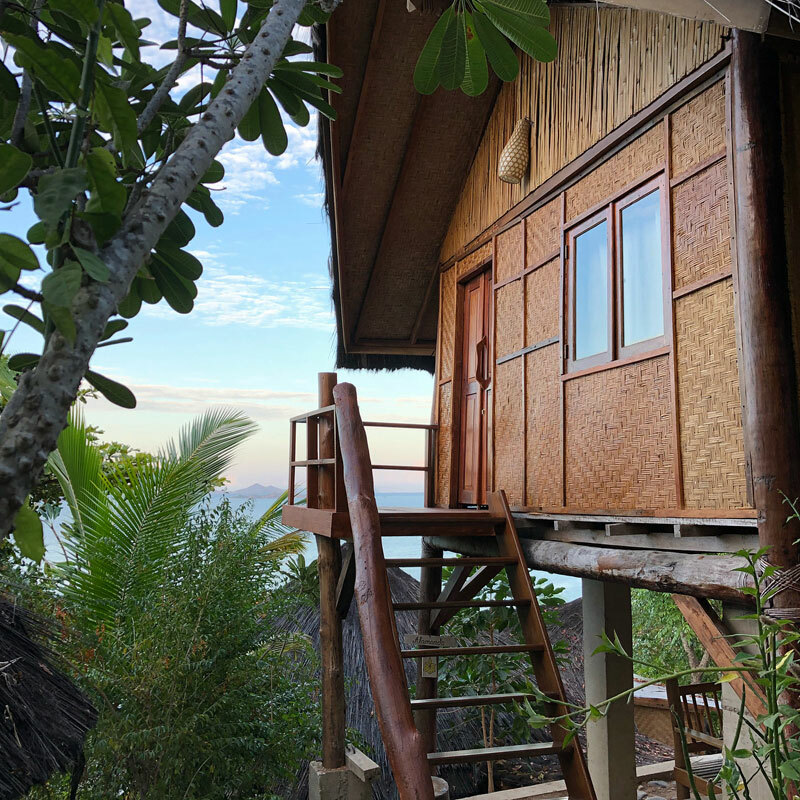 Although not entirely built on a tree, your all-wooden cabana is set among tall trees that thankfully make space for the endless ocean views. 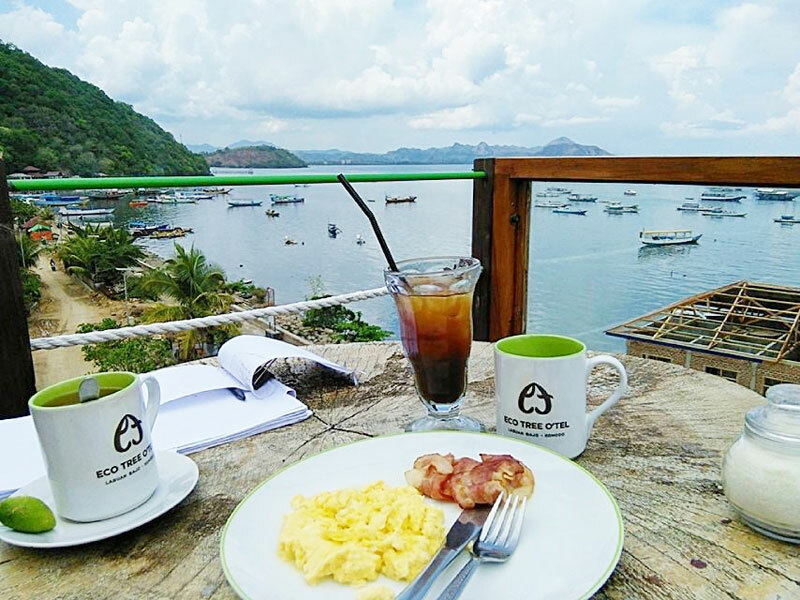 Services at the villas are considered basic and not luxurious; after all, you’re not here for 5-star treatment but the beautiful views of the vast ocean dotted with green hills and sailing boats will make you forget those inconveniences. 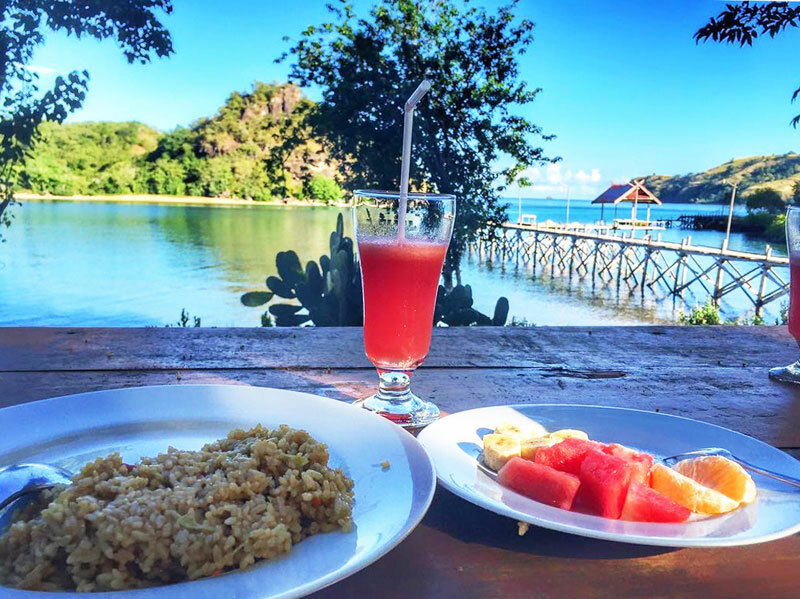 Located a short distance from the harbour, they also own a ship to accommodate those who wish to explore the Komodo archipelago, and what can be better than coming back from your day trips to a comfortable ocean view stay? 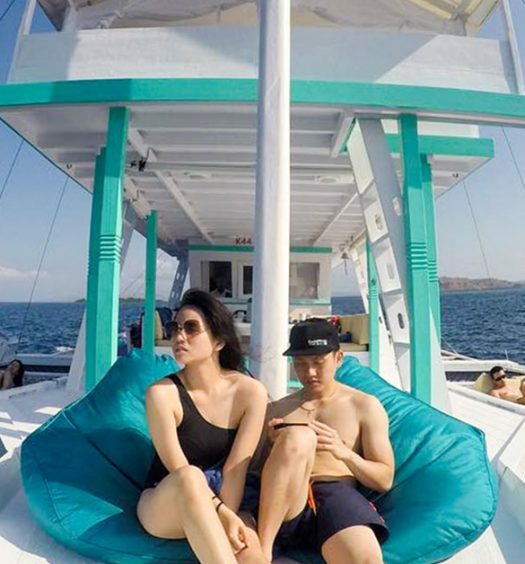 Their Aqua Luna Selini boat will take you to explore the magical Padar, Rinca and Komodo Islands to enjoy pristine waters, powdery beaches and rugged scenic landscapes. After a full day exploring the nearby islands, come back to enjoy a seafood feast in the surroundings of nearby Pede Beach. A great place to settle at is Atlantis Beach Club (seven minutes’ drive from your villa), a place where you get to indulge in sea-to-table dishes that are freshly caught and ready to tickle your tastebuds! Views from the sea view rooms look pretty much as though you’ve been transported to Greece and since the hotel is newly opened as from 2018, you can expect clean rooms equipped with plush duvets and essential toiletries (though you won’t spend much time in there). The staff at the hotel will make sure you never want to leave – they’re incredible in the sense that they will make each and every guest feel special. Spend a night here and they will know most of your names! If there’s something to highlight it is that the staff makes the difference at this stay. Live music and yoga classes will keep you entertained on weekends and a free shuttle service runs a few times per day so you can always head to town for more action. Perfect hilltop location aside, this little piece of paradise makes a supremely relaxing getaway. 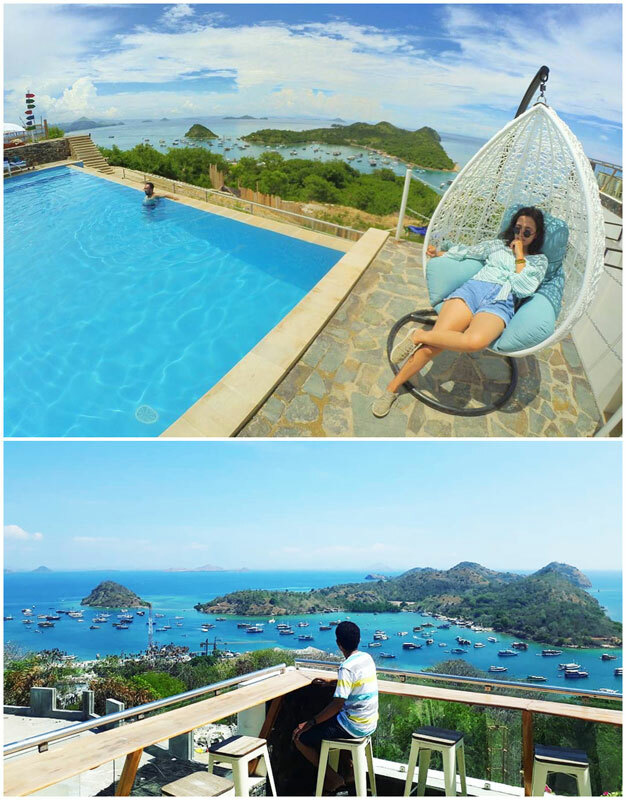 Golo Hilltop also commands postcard-perfect views of the azure ocean lying in front. Roll out of bed to feast your eyes on multiple shades of blues! 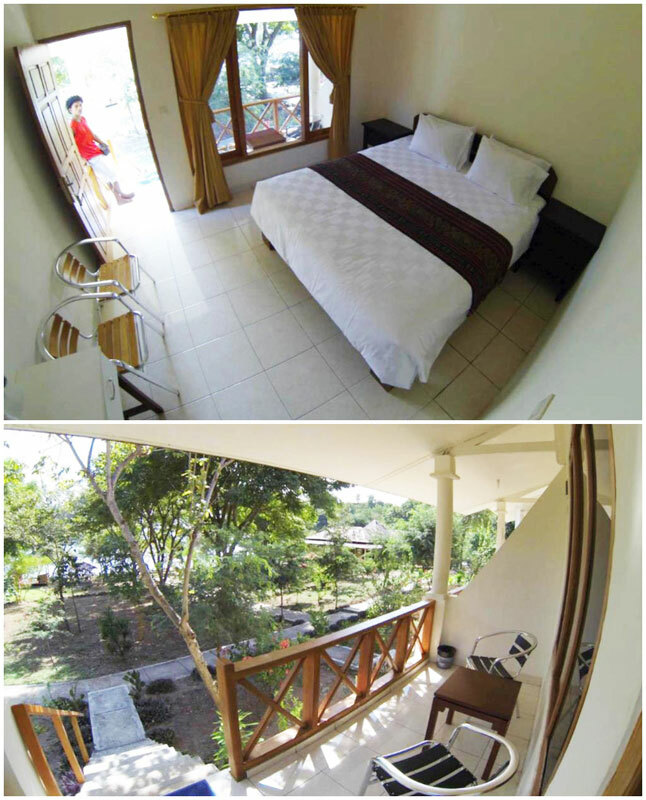 Besides your bedroom, you also get to enjoy the magical scenery from the on-site swimming pool and restaurant. 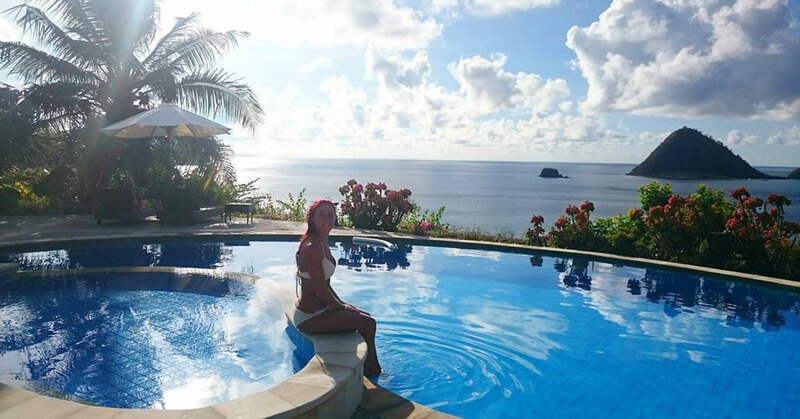 Close your eyes, now open them; no it wasn’t just a dream – reality here includes swimming and eating with unobstructed views of the ocean on the side, framed by lush green flora. Rooms are clean and comfortable but do not deserve more attention than the magical views they offer. With an almost far-flung location and having only 10 bungalows available, tranquillity and serenity are guaranteed at Golo Hilltop. The catch? 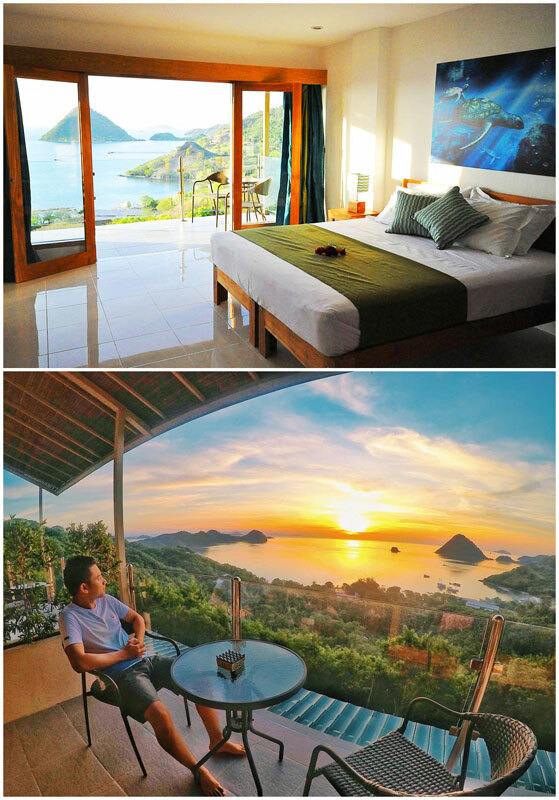 It’s almost always fully booked as it is a travellers’ favourite accommodation option in Labuan Bajo. Make sure to book in time! They don’t call it a ‘sea view room’ for nothing! 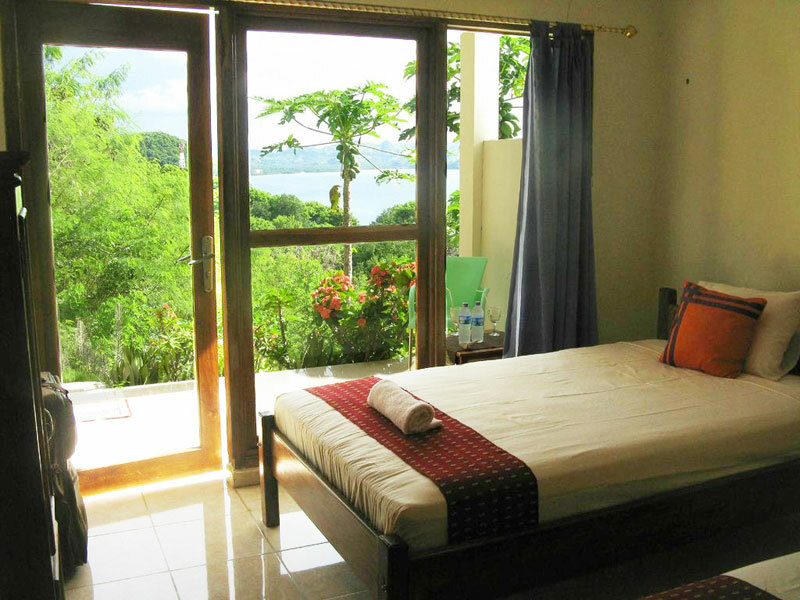 At Sunset Hill Hotel, you get to enjoy alluring views of the horizon right from your bed. The best part is that you’ll be compelled to make the most of your lazy day in bed as you can even marvel in a magical sunset in the evening. The hotel has few frills, but it doesn’t feel bare bones, either – it is the embodiment of a tropical escape, away from the buzzing city life, you’ll be greeted by the soothing sound of the ocean and salty scent of the beach. The hotel’s name sure isn’t an idle boast, be sure to be back to your stay to relish a magical sunset. Gaze in awe from your bed as the fiery ball of fire sinks beneath the horizon, dyeing the sky with perfect hues of orange, red, pink, purple to end in a dark blue show! 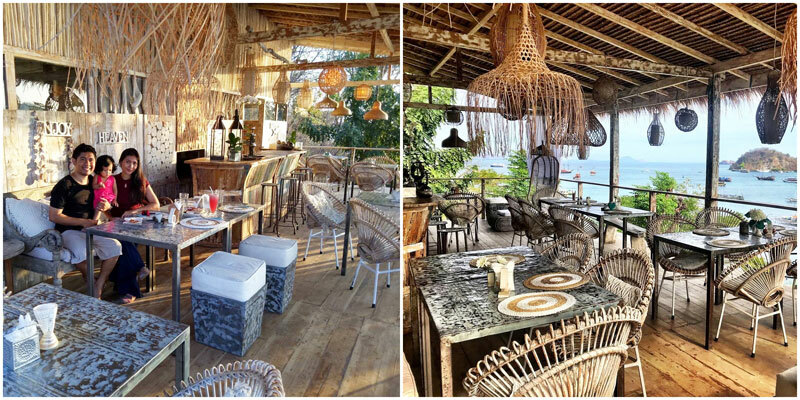 Naturally, its restaurant and rooftop bar also offers nothing short of jaw-dropping ocean views – a place where you get to mingle with other guests, make new friends and enjoy the sunset with a cocktail or two. 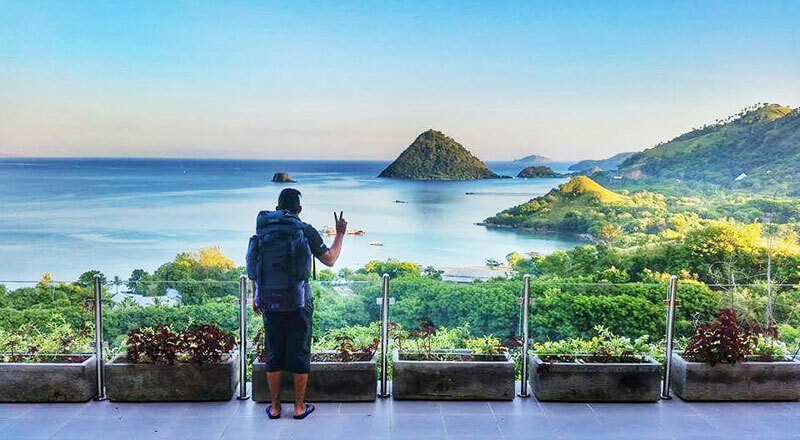 For your convenience, the hotel also provides taxi and motorbike rental services to help you travel around and go on far-flung adventures around Labuan Bajo. 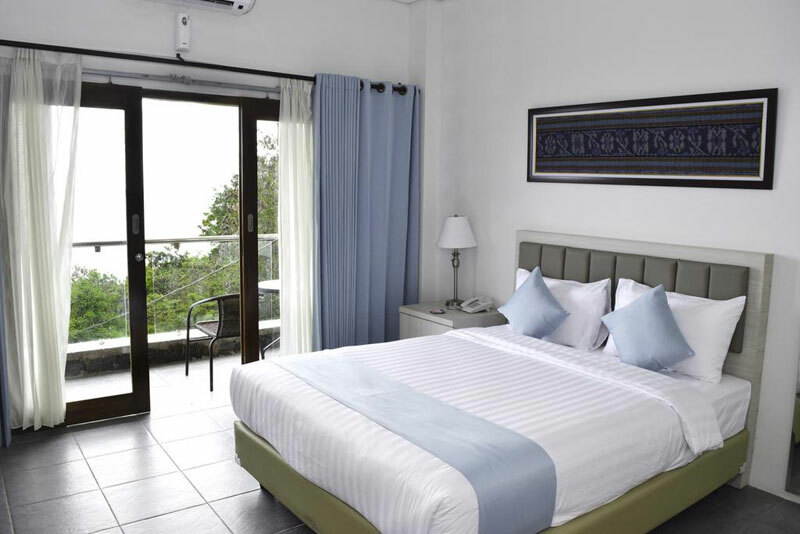 The 13 rooms here are spartan but give charming ocean views that are often dotted with sailing boats, so it is no wonder that Green Hill Boutique Hotel is almost always filled with returning guests. 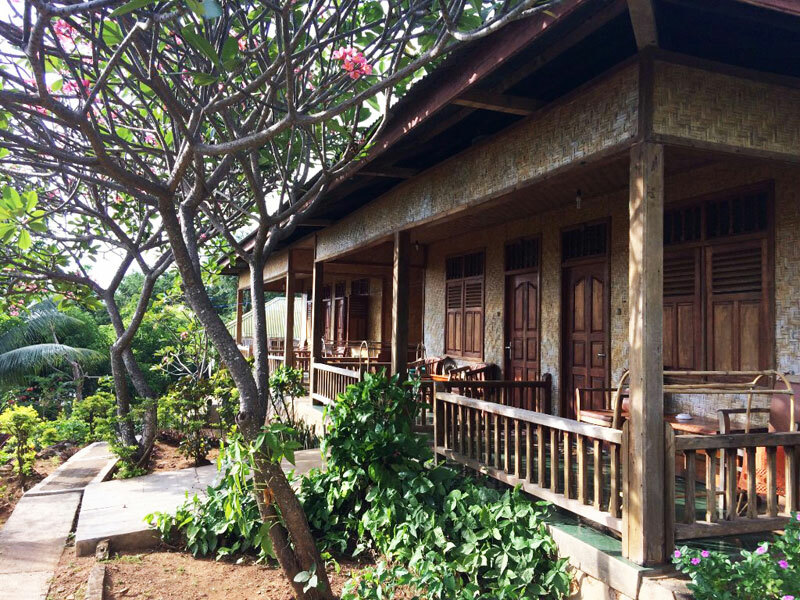 This lush little haven is conveniently located near the harbour making it the ideal spot to stay at and come back to if you’ve planned day trips around Flores and the nearby Komodo archipelago. Green Hill Boutique Hotel feels like home away from home for many. The hotel has a familiar, cosy atmosphere that feels nothing but comforting after a full day of adventure in the surrounding rugged landscapes. 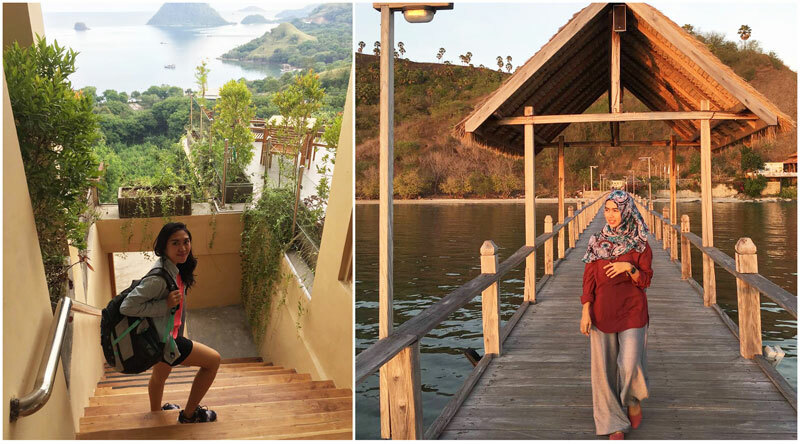 On your resting days, join other travellers at the hangout spot to exchange all of your adventures, tips and tricks for traveling around the Komodo Islands or share a meal at the on-site restaurant where delectable home-cooked Indonesian food is served! Try the easy-going charm of Eco Tree O’Tel as Edo (the hotel manager) makes you feel at home immediately. This small establishment comes with mesmerizing sea views and is designed to disturb the island’s natural beauty as little as possible by optimizing the use of solar energy. They also collaborate with local craftsmen for hotel interiors and you’ll be able to see plenty of wooden sculptures or Songket (traditional Indonesian fabrics) around the hotel. 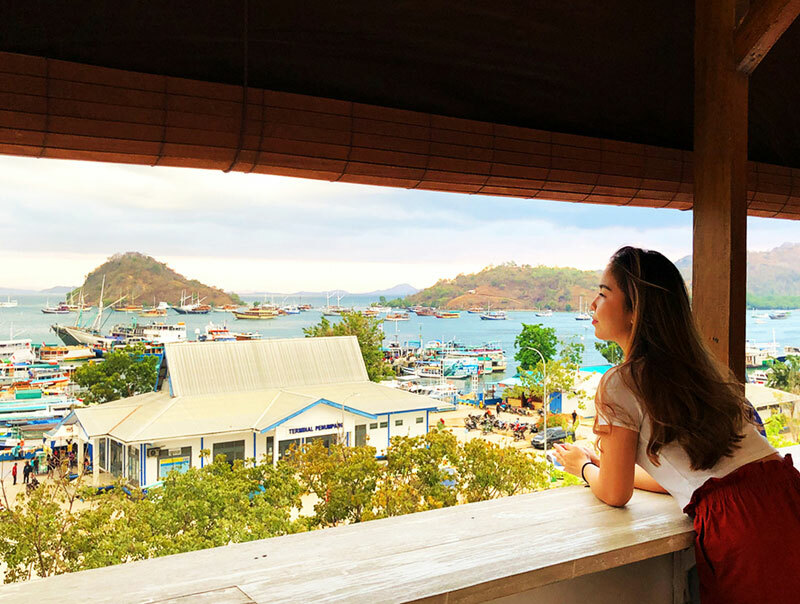 The best feature is the view it has to offer as some of the rooms are facing the sea, but opening your curtains also gives you a good chance of spotting Rinca and Komodo Islands that shoot up from the deep blue Flores Sea. 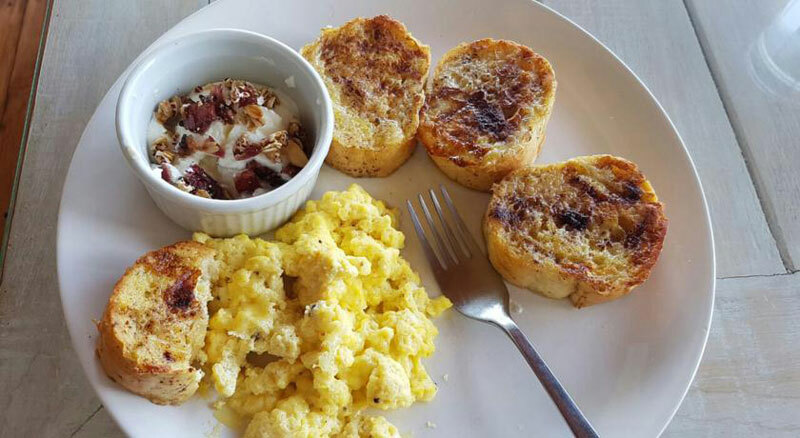 Their sublime home-cooked garlic chicken served at the on-site restaurant is another highlight as guests mention they have ordered this every night throughout their stay. 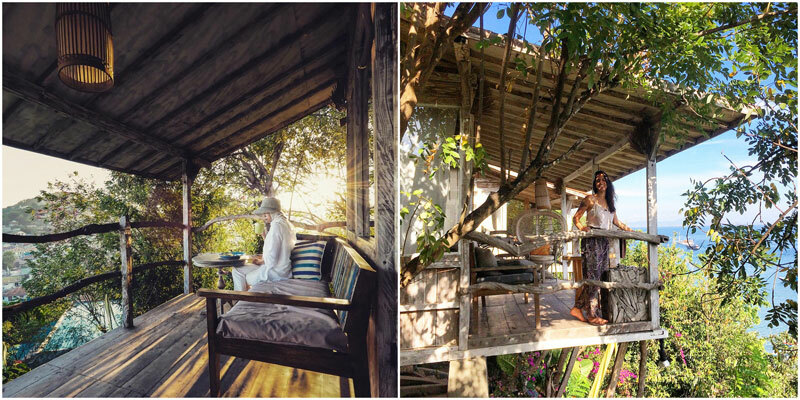 Their Tree Top Bar and Restaurant is also said to be an ultimate sunset spot. Don’t expect to be pampered though, as the accommodation is basic but clean. Sink in ultimate relaxation as you enjoy comfortable rooms with an unbeatable view at an affordable price at Eco Tree O’Tel. 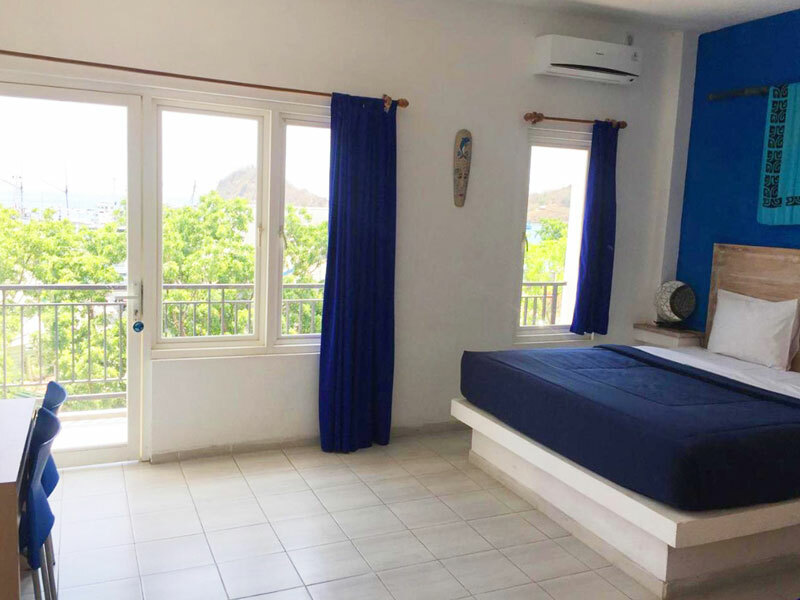 Santorini hues and popping coloured bean bags make Blue Ocean Hotel a top-ranked budget accommodation in Labuan Bajo. But that’s not about it as the reasonably-priced accommodation surprises guests with views of the nearby harbourfront. Located right across the harbour, this hotel proposes a minimalist concept, yet is very comfortable and convenient as you are set just three minutes away from your departure point (boats to the islands depart from the harbour). Right on the main street, you will be able to find several tour agencies to plan your day trips to the pristine surrounding islands. 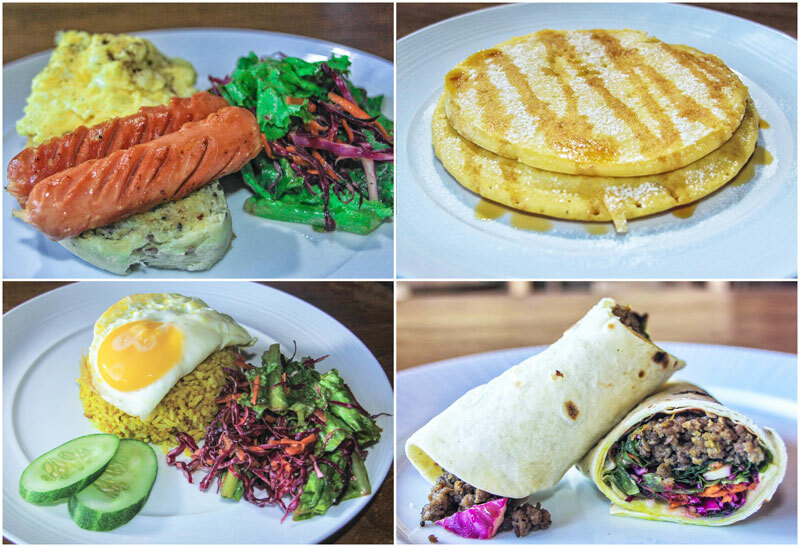 Restaurants and bars are also located in the vicinity so you can simply take a short walk to enjoy a hearty meal. 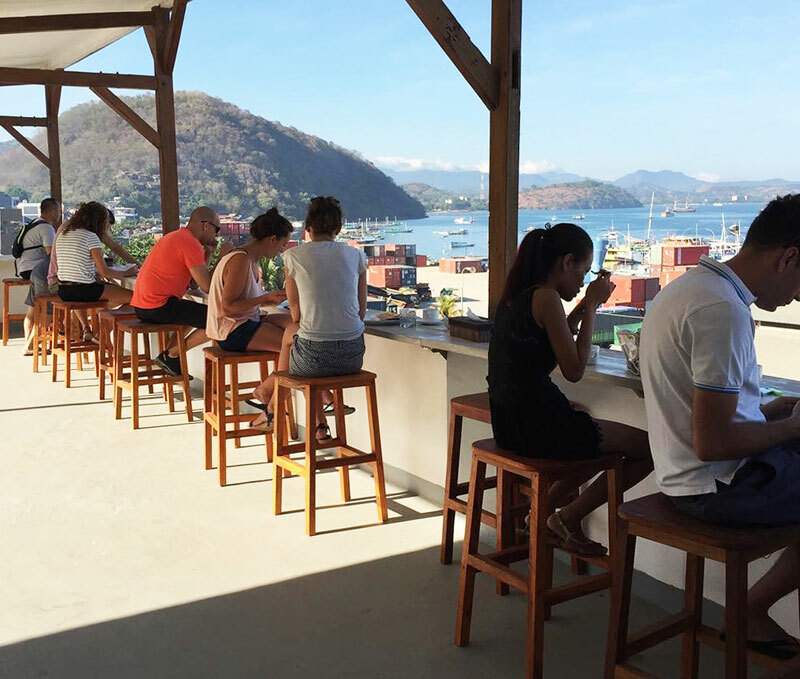 When you’re done exploring, come up to the rooftop and meet other fellow travellers and like-minded people. Who knows, these might be your adventure buddies for the next few days! For a room with a five-star view, Gardena Hotel is hard to beat. Depending on your budget, you get to choose between rustic rooms (all wood and bamboo) or their recently renovated air-conditioned rooms. Although located just 50 metres from the harbour, the hotel offers ultimate peace and tranquillity with calming views of the ocean. The hotel has 39 no-frills but comfortable rooms. Request for a sea view room on top of the hill for the best views but be ready to combat an endless series of stairs. Ideal for those looking for a Robinson Crusoe-like experience, pack your electronic devices away as internet isn’t guaranteed at Gardena Hotel, but take advantage of this to unplug from your virtual life and reconnect with those around you! Unfortunately, a continual complaint of travellers is that the staff members speak very limited English, sadly. Nevertheless, you can be sure that they will do all they can in serving you the best. 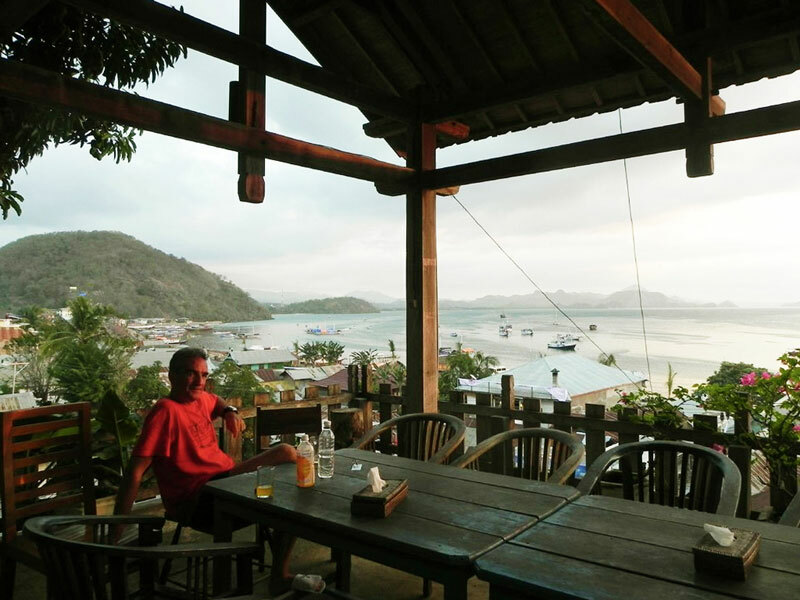 CF Komodo Hotel made its way to our list solely for its good location and great ocean views. Seriously though, there is nothing much to rave about the hotel – be prepared for cheap amenities and basic accommodation facilities. 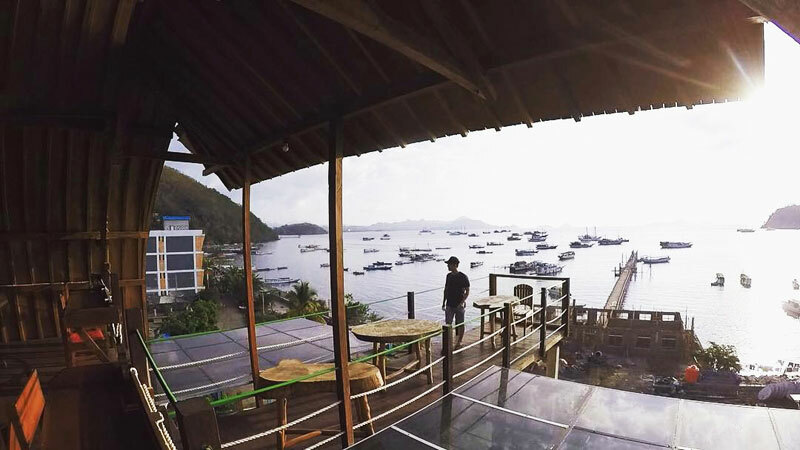 Perched on a hill in the middle of Labuan Bajo, the strategic location of the hotel allows you to travel around easily. 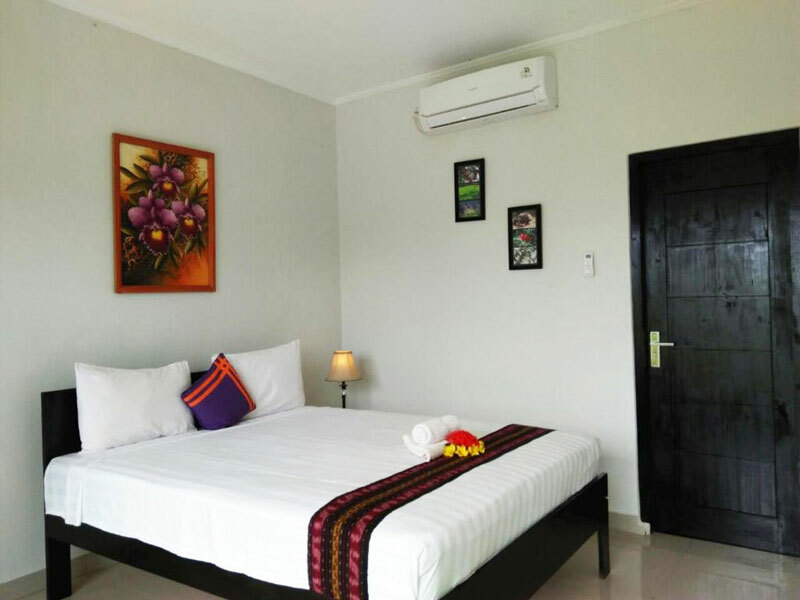 A stay here means that both harbour and city can be easily accessed although they also provide free shuttle services (scheduled timings) to town so that adds up to their convenience. Bookmark their Superior Ocean View Room and get rewarded with majestic views of the ocean. Sunset time doesn’t disappoint either as you get to relish on the magical sky show right from your balcony. We’d recommend you to double confirm your reservation prior to your arrival as previous guests have mentioned that the hotel was overbooked. Better be on the safe side! 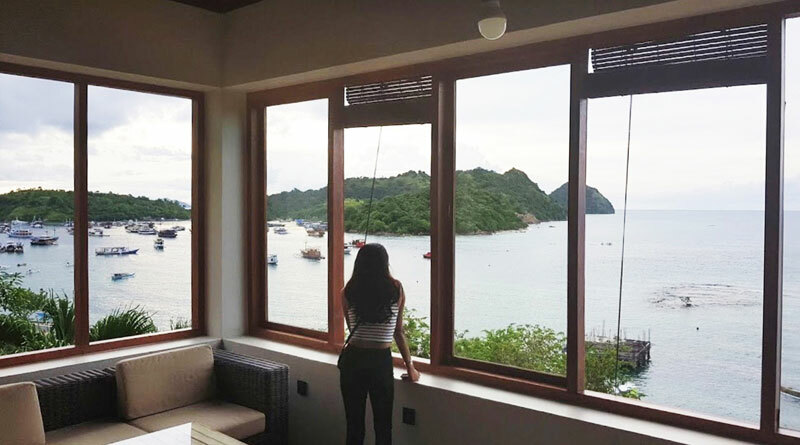 The low-key Matahari Hotel & Restaurant is one of the most modern budget hotels in Labuan Bajo – a real charmer! We’re not talking about 5-star facilities as this remains an affordable hotel but comfortable beds, clean bathrooms, an on-site restaurant and magazine-approved ocean views have most visitors here wishing they’d stayed longer. Located just a few minutes away from the harbour, the hotel serves as an ultimate resting spot for those who plan on sailing to the nearby islands to bask in crystal clear waters, powdery sand and rugged landscapes. After hours exploring the surroundings, return to your retreat to unwind at your ocean-view balcony. We’re also so grateful for the availability of hot water at the hotel as this is all you can ever wish for after a full day at sea. Looking for a secluded beach hotel where you can enjoy a sea, sand, and sun vacation right at your doorstep? 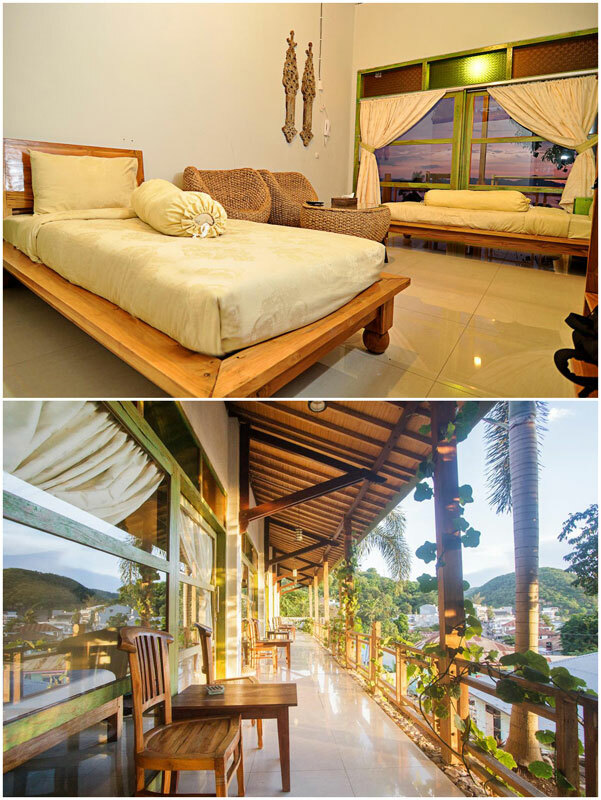 Don’t miss out on Waecicu Beach Inn as this is one of only a few properties slap bang on the serene beach of Waecicu. The sparsely furnished wooden bungalows may be basic but they have small private verandas and some awesome sea views. Now that you’re within splashing distance to the sea, take a few steps out to enjoy a sweeping ocean with white powdery sand. There is little else to do than taking a sea dip or enjoying a snorkelling session before embarking on your daily island excursions. In the evening, head over to the nearby wooden jetty and relish Mother Nature’s award-winning show as the sky gets undressed to impress with magical bright colours. If you’re ready to splurge on this vacation, try the nearby Sylvia Waecicu Beach Resort, which is an upmarket version! 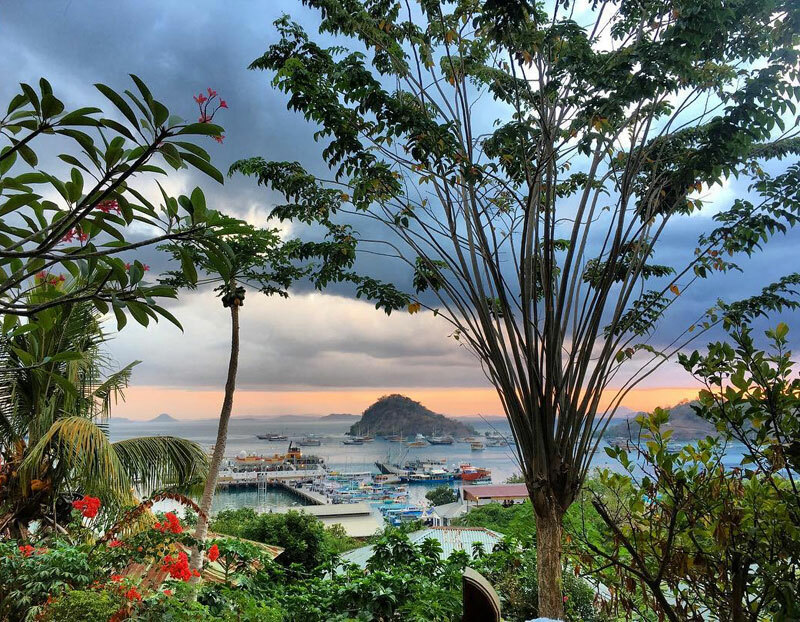 Not strictly on the beach but Blue Parrot is set within walking distance (five minutes away) from the harbour and is an upmarket affordable stay in Labuan Bajo. When we say upmarket, we’re still talking about less than USD $60 per night so if that isn’t a complete steal, then we don’t know what is! The aptly-set oasis comprises a 3-bedroom villa with different room categories varying between garden and ocean views. Every room is spacious and has its own outdoor patio that invites you to enjoy the island’s stunning views. Besides, the villa also has a shared lounge where you can meet and chill in the evenings. There’s always staff at the reception so you can be sure your every need is taken care of. 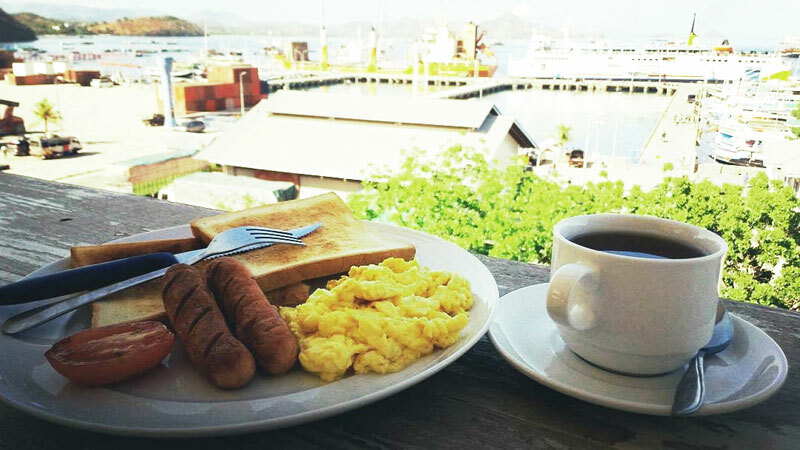 A savoury breakfast is offered every morning so you’re set and ready for a full day of adventure in the Flores Sea. Nearby, you’ll find countless amounts of dive centres, restaurants, and convenient stores to store up your necessities. After all who says no to junk snacks when on a boat trip?! To explore West Flores, we recommend you to rent a car with driver or guide as the road conditions here will be difficult to navigate. One popular car rental company on this island is Komodo Shuttle, which offers a wide variety of cars that include a driver and fuel. Price: From Rp. 600,000 per day (approximately USD 42) for city tour and Rp. 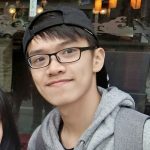 1,400,000 per day (approximately USD 97) for overland trip. 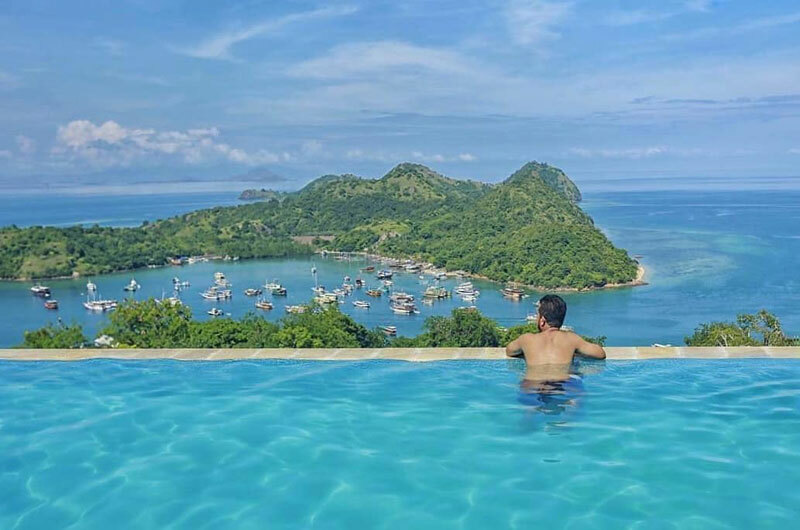 Our pick of affordable ocean view hotels in Labuan Bajo makes ideal bases for exploring the nearby pristine islands in Flores. Where are you staying at next? Let us know where you’d like to wake up to ocean views!